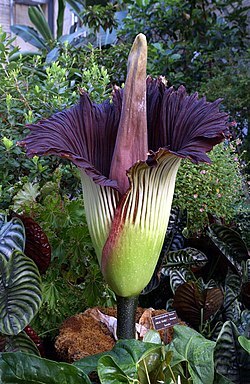 Amorphophallus campanulatus Blume ex Decne. Candarum Rchb. ex Schott & Endl. ^ Sedayu, A., C. M. Eurlings, Gravendeel, B., & Hetterscheid, W. (2010). Morphological character evolution of Amorphophallus (Araceae) based on a combined phylogenetic analysis of trnL, rbcL and LEAFY second intron sequences. Botanical Studies, 51, 473-490. ^ Hetterscheid, W., & Ittenbach, S. (1990). Everything you always wanted to know about Amorphophallus but were afraid to stick your nose into! Aroideana, 19, 17-20. Amorphophallus in Brunken, U., Schmidt, M., Dressler, S., Janssen, T., Thiombiano, A. & Zizka, G. 2008. West African plants - A Photo Guide. Forschungsinstitut Senckenberg, Frankfurt/Main.